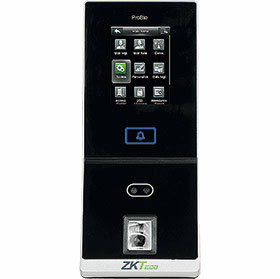 The ProBio is the first access control terminal to apply the Silk ID fingerprint and face technology together. Silk ID offers high identification rates for dry, wet, and rough fingers, but also provides security with live finger detection. It can operate under strong light and activates automatically when finger approaches to save power. Using ZKTeco’s latest ZKFACE version 7.0 high-speed face recognition algorithm, it has high verification speed and a low error rate, in addition to being able to effectively prevent duplicated registration. In addition, the new ZMM 220 hardware platform has a clock rate of 1.2 GHz, greatly enhancing the speed of fingerprint and face verification. • Silk ID fingerprint sensor. • Simple management and scalability. • Multiple verification modes: face/fingerprint/card/password. • Built in camera for event snapshot or user photo.